Bands are finding a profitable new audience: TV networks and their advertisers. They're shelling out six- and seven-figure paydays to bands like The Eagles and The Wallflowers to help make their pitches to ad buyers more memorable. Hey, it beats putting the money into a few decent scripts, right? After saying, in print, that his client Sarah Michelle Gellar "was nothing before The Grudge," William Morris Agency President David Wirtschafter has one less client this morning. The sizzlin' hott master thespian has decided to seek reprentation elsewhere. How could Wirtschafter ignore her 7 fabulous years on Buffy? Or her spectacular wood-inducing performance in Cruel Intentions? And Scooby Doo- OK, he may have a point there. The latest 24 in 99 synopsis, with the Geek-In-Chief at the controls. Then: Vito delivers an all new Geek/CounterGeek. Also: Day 2 of our X-Files Trivia week. Plus! Our picks for Tuesday night's Tube! It's all tomorrow at TVGeekSpeak.com! Tally ho! Pip, pip! Jolly good! There's no more certain sign of impending doom than when petitions start circulating. 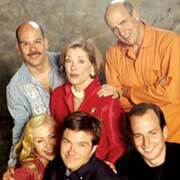 And Arrested Development fans are in full panic mode are in full panic mode, with several on-line petitions circulating. Ratings continue to stink, but Fox can also use the occasional critical acclaim Development provides. At this point, Vegas odds are pick 'em. Bravo's hit Project Runway will get a second season. The future of the show was in question, thanks to the uncertain fate of Miramax's properties. The series could be back as early as early as next fall. The Insider anchor Pat O'Brien has entered an alcohol rehabilitation program. The show's New York host, Lara Spencer, will take over during O'Brien's dry-out. We asked you: How can NBC stop the bleeding? What did Henry Blake's brother do for a living? Answer D). He was a warden. The Geek Files: Stealing From Steele? Pusher is back and she's geekier than ever. Here's her latest Geek Files. A few years I caught an episode of Diagnosis Murder (Yes, Diagnosis Murder. Shut up.) entitled "Death in the Daytime." Amanda won a guest role on The Young and the Restless - an inside joke for anyone who knew that Cynthia Gibb also starred on Y&R. While on the set, Amanda mistakenly opens a door and intrudes upon an embracing couple. This is when I flashback to something I saw a decade before. Didn't this exact thing happen to Remington Steele when he was presenting an award to Lloyd Nolan in the episode "Cast in Steele"? Yes. Yes it did. The RS episode also guest starred Dorothy Lamour and Virginia Mayo. Steele and Laura Holt assume that a killer is targeting the stars of the award show but it turns out that the killer is after Steele. The reason? He walked in on the killer holding up (read: embracing) his earlier victim. And now Amanda has just walked in on the same situation! Who could so blatantly rip off an entire plot, I wondered. This was insane. This DM episode had complete dialogue lifted from RS! How could no one else notice but me? OK - so there is nobody else who would notice. I researched this on the web and found nothing. It wasn't until I received copies of both episodes that I finally found my answer. Upon my fifth reading of the credits, one name repeated - Michael Gleason. He was the Executive Producer for both shows! He actually stole his own idea from 11 years earlier! And got away with it. I'm going to start my own TV Geek crime-solving business. How's Remington Murder? Or Diagnosis Steele? The Geek Files: Confessions of a TV Geek airs every Monday. Our own legal expert analyzes last night's Boston Legal.